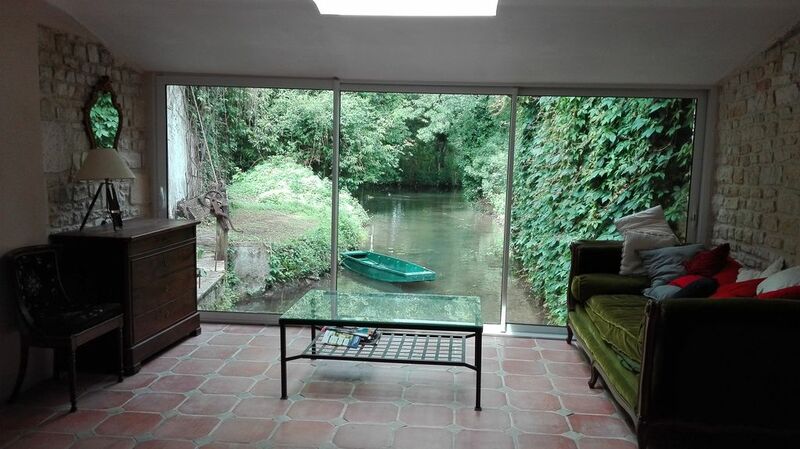 True haven of peace on a private island bordered by the Aume, originality and return to nature with this old mill that can comfortably accommodate 14 people (7 rooms) with possibility of extra beds. Ideal for family gatherings or friends. The mill is composed on the ground floor: a large entrance, a summer living room feet in the river, a more isolated part with office, bedroom and bathroom, a bathroom with toilet, a Kitchen, living room with fireplace and large bay window overlooking the pool. The older part of the mill is composed of a large dining room with fireplace, reading corner with fireplace and staircase leading to the first floor. Upstairs, you will appreciate the large hallway overlooking an older part composed of three bedrooms and a bathroom with toilet and a newly furnished part with three bedrooms, three bathrooms one of which is independent rooms with WC. Linen is included in the rental, you will feel right at home! The garden is divided into two parts on each side of the mill: a small garden with swing, slide and trampoline where your children will be safely, a wooded island where the pool is located. Also to see in Angoulême the famous festival of the comic, the circuit of the ramparts and other festivals. Très belle maison pour un très beau week end ! Les propriétaires sont à l'écoute et très sympa, tout comme les personnes qui se sont occupés de nous sur place. Juste prévoir quelques ventilateurs car il a fait très chaud et du coup un peu de moustiques aussi ...! Belles prestations, piscine très grande et chauffée, et la promenade en barque ... mémorable !! JE RECOMMANDE VIVEMENT CETTE LOCATION A TOUS !! Très bon contact des propriétaires avant notre venue. Accueil au Moulin très chaleureux. Nous avons passé un agréable moment en famille, la maison est très grande, à 14 personnes, on ne se bouscule pas. Petite ballade en barque, super sympa, endroit reposant et ressourçant. Une location au top !! !